Matt Stajan celebrates after scoring the go-ahead goal against the Montreal Canadiens. A big “thump” was the sound of victory for Matt Stajan and the Toronto Maple Leafs. Stajan broke in alone and beat Montreal goaltender Cristobal Huet with 1:34 remaining in regulation to give the Leafs a 3-2 victory over the Canadiens ( 700K ) at the Bell Centre. The 23-year-old center ended a nine-game goal drought when he raced down the right side and beat Huet with a slap shot. Tomas Kaberle and Mats Sundin also scored for the Maple Leafs, who lost 3-2 in New Jersey on Friday. Vesa Toskala, who lost that game, made 32 saves to win this one. “I thought coming into this building on a Saturday night on back-to-back nights, with them rested and them rolling the way they are, to win in regulation, it’s a great outing for us,” Leafs coach Paul Maurice said. Montreal had been 5-0-1 in its previous six games. Chris Higgins and Mike Komisarek scored for the Canadiens, who’ve lost both games with the Leafs this season. Kaberle opened the scoring with his fifth goal of the season on a power play 1:18 into the game. Komisarek scored late in the first to tie it at 1, and Higgins got his sixth goal on a 5-on-3 power play early in the second to put the Canadiens up 2-1. Sundin re-tied it at 6:04 of the second period when his centering pass deflected off Montreal’s Mathieu Dandenault and into the net. It was the second meeting of the season between the two teams, who have faced each other every season since the League was formed in 1917. Kaberle scored the overtime winner in Toronto's 4-3 win over Montreal on Oct. 6. Boston gave Ottawa one too many chances on the power play, and the Bruins paid the price. Mike Fisher scored Ottawa’s third man-advantage goal of the game by banging in a rebound with 6:11 remaining in regulation as the Senators improved to 11-1-0. The Bruins got a 42-save performance by goalie Tim Thomas, but it wasn’t enough against a power-play unit that went 3-for-6. The Bruins got two even-strength goals from Chuck Kobasew in the second period, but it wasn’t enough. 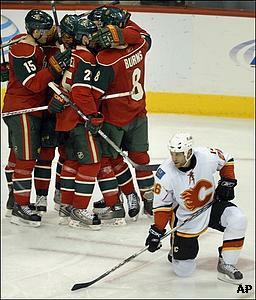 Fisher scored off his own rebound in the first period and Dany Heatley tied it in the second on a one-time blast. Boston coach Claude Julien was disappointed for his goaltender. victory over New Jersey and get back to the .500 mark. 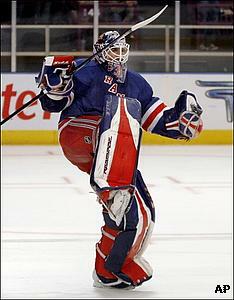 New York's Henrik Lundqvist celebrates after the Rangers defeated the Devils, 2-1, in a shootout. Henrik Lundqvist stopped 26 shots and all three shootout attempts for the Rangers, who’ve won three in a row and are now 6-6-1 despite scoring just 23 goals, the fewest in the NHL. Ex-Devil Scott Gomez scored 6:01 into the game and New Jersey’s Sergei Brylin tied the game 33 seconds later. The rest of the night belonged to the goalies. Matt Cullen left the Carolina Hurricanes after their Stanley Cup win in 2006 to sign with the New York Rangers. Happily for Carolina’s power play, he’s back. Cullen, who was traded back to the Hurricanes by the Rangers last summer, had a goal and an assist on the power play as Carolina downed Florida at the RBC Center. The Hurricanes’ power play, fifth in the League coming into the game, scored twice in four tries against Florida. “We’re at our best when there's a lot of movement, guys jumping in and out of holes, side to side, downhill, up high, and we're able to create chances from that,” Carolina coach Peter Laviolette said. The goal was Cullen’s third of the season with the man advantage and helped Carolina avenge a 4-2 loss in Florida earlier this week. The Panthers, now 0-12-1 in their last 13 visits to Raleigh and 2-6-0 on the road this season, got goals from Jay Bouwmeester and Richard Zednik. This time, Ilya Kovalchuk got hot before it was too late. Kovalchuk scored three times in the third period Thursday night in Ottawa, but with his team trailing 5-0, it was too late to prevent a 6-4 loss. This time, Kovalchuk began his hat trick when the Thrashers were only down 4-1, and it was enough to rally Atlanta to a victory in Tampa. The Thrashers battled back from a three-goal second-period deficit, tying the game at 4-4 when Kovalchuk scored his second goal of the game from the left circle at 7:21 of the third period. Pascal Dupuis converted a feed from Bryan Little with 2:08 left, and Kovalchuk finished his hat trick by hitting the empty net with 1:22 remaining. The Thrashers are 5-3-0 under Waddell after losing all six games before coach Bob Hartley was fired. The Lightning, who got two goals from Shane O’Brien and one each from Michel Ouellet and Brad Richards, hoped that returning home would help them rebound after being swept in a three-game swing through the New York City area. It didn’t – not when the Thrashers scored three goals on five shots in the final period. Minnesota teammates celebrate Marian Gaborik's second goal of the game. didn’t let Calgary off the hook. “This was kind of revenge, and it was great that we battled hard and got two points,” said forward Marian Gaborik, who scored twice and added an assist. Brian Rolston and Branko Radivojevic also scored for Minnesota, and Niklas Backstrom stopped 23 shots in his return after missing four games because of a strained groin. Jarome Iginla had the only goal for Calgary, which was coming off a seven-game homestand. The Flames continue to struggle on the power play. They were 0-for-3 against the Wild and are now 3-for-32 in their last six games – and 1-for-17 on the road this season. Minnesota also scored one goal on the power play and another two seconds after a Calgary penalty expired. Who needs power plays? Not Patrick Sharp and the Chicago Blackhawks. Sharp scored a pair of shorthanded goals in the third period as the Blackhawks stunned a sellout crowd in St. Louis. Sharp stole the puck from Blues defenseman Barret Jackman and beat Manny Legace on a breakaway at 7:41 of the third period, breaking a 1-1 tie. After Paul Kariya tied it with a wrist shot past Nikolai Khabibulin at 14:40, Sharp banged in Rene Bourque’s rebound with 2:21 left in regulation after a mixup between Jackman and Legace. “All I know is we have the puck under perfect possession and five-and-a-half seconds later, it's in the back of our net after we had a couple of great chances at the other end,” Blues coach Andy Murray said. Two rookies, Chicago’s Dustin Byfuglien and St. Louis’ David Perron, scored in the first period. Another Chicago rookie, Jonathan Toews, saw his points streak end at 10 games, marking the first time in his young NHL career that he didn’t notch a point. The Sedin twins took care of Vancouver’s slump and Colorado’s home winning streak at the same time. Daniel Sedin had two goals and an assist and Henrik Sedin had three assists for Vancouver, which had lost six of its last eight. Henrik set up Brendan Morrison’s tie-breaking goal with 4:06 left in the second period and Ryan Kesler made it 3-1 at 1:16 of the third. After Marek Svatos scored at 5:06, Daniel converted a feed from his brother with 6:35 remaining and the Canucks up two men. Svatos scored again with 10 seconds left. “You can’t give guys like that time and space,” Colorado’s Ian Laperriere said of the Sedins. 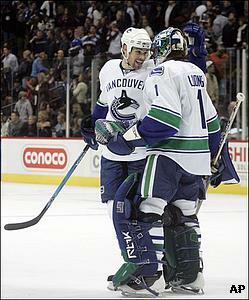 Vancouver's Willie Mitchell celebrates with Roberto Luongo after beating the Colorado Avalanche 4-3. Colorado had matched a franchise record set by the Quebec Nordiques in 1995 by winning its first six games. Anaheim finally won a road game by playing a team that can’t win at home. Jean-Sebastien Giguere stopped 30 shots as the Ducks finally won away from Honda Center after going 0-5-1 in their first six road games, including one in London. Corey Perry scored a pair of goals and had an assist for Anaheim, and Ryan Getzlaf scored once and had two assists. The Ducks also got a goal from defenseman Mathieu Schneider, who was playing in only his second game after returning from a broken ankle. The injury-riddled defending champs hope things will improve as they get healthy. The Coyotes have no trouble winning on the road – they’ve won four in a row away from Jobing.com Arena. But they’ve dropped six in a row at home after an opening-night victory over St. Louis. Jeremy Roenick is just one goal away from making history after the 499th of his career proved to be the game-winner for the Sharks, who avenged a home loss to Los Angeles on Friday. Jason LaBarbera’s glove for his fourth goal of the season. It was Roenick's 85th game-winning goal during regular-season play. Jonathan Cheechoo added an insurance goal with 6:23 to play, one-timing the puck past LaBarbera from 25 feet. Joe Pavelski gave the Sharks an early lead, beating LaBarbera with a one-timer from the left circle just 2:21 into the game. Stuart tied it at 5:23, firing a slap shot from the left point past Evgeni Nabokov.